The BYNA PROJECT is pleased to announce that a generous donor has contributed to this project allowing the score price, which was $120.00 to be reduced by half! * Includes media postage rate for two full scores with separate oboe and cello parts. 7 day delivery. AUDIO EXCERPTS OF ALL 15 PIECES NOW ONLINE! The following excerpts taken from the recording of the premiere performance at Porter Center for the Performing Arts, November, 2005, featuring Julia Broxholm, soprano; Kelly Vaneman, oboist; Anthony Fanning, cellist; John Cobb, pianist. Austin, Texas composer Rudy Davenport (see bio), originally from Western North Carolina, and Delilah Elsen, (see bio) spent many hours working on this major chamber music work, BYNA: Life Songs of a Southern Appalachian Woman of Cherokee Descent for soprano, oboe, cello and piano. The lyrics for BYNA come from a play of the same title, written by Elsen, also originally from Western North Carolina. Byna’s songs are based on the character’s life experiences as a Southern Appalachian mountain woman of Cherokee descent. 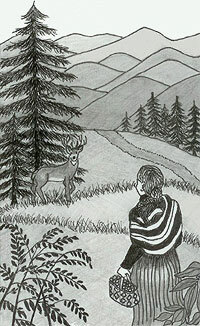 Byna is a fictional character, representative of the many women of Cherokee descent of her era—from the early 1900s-70/80/90s—who lived in the mountains their entire lives. The Byna we meet is deeply in tune with the beauty and the natural world around her; she is in her late 60s, has lived in a small cabin in the woods for most of her life and has recently lost her husband of 50+ years. Davenport and Elsen, after much discussion, created lyrics which preserve Byna’s native dialect (in the best possible sense). They settled on 10 passages from the play for Byna’s Life Songs. Altogether, Davenport set 11 sets of lyrics, or songs; 10 of these pieces are original songs, and 1 piece is an arrangement of Byna’s favorite old gospel hymn. The work also features four original instrumental interludes, bringing the total number to 15 pieces. Performance time for this work runs just over one hour. 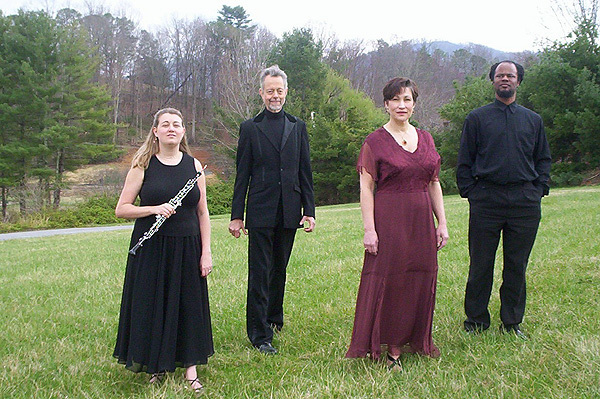 The premiere of BYNA took place at the Porter Center for the Performing Arts at Brevard College, Brevard, North Carolina in late 2005, featuring the BYNA ENSEMBLE, (at left) accomplished musicians residing in the Appalachian region including: Julia Broxholm, soprano; Kelly Vaneman, oboist; Anthony Fanning, cellist; and John Cobb, pianist. The ENSEMBLE was formed to premiere and perform the work in North Carolina, Georgia, South Carolina and throughout the Southern Appalachian during a two year period. As Elsen was inspired by the traditions of her mountain heritage and Byna’s place within that heritage, Davenport, has also tapped into the wells of his mountain upbringing and his years of experience developing his style of Appalachian inspired music. Byna’s words set to Davenport’s music truly make for a dynamic musical experience and is sure to be an inspiration to all who Byna: Life Songs of a Southern Appalachian Woman of Cherokee Descent. Byna is a chamber music work, centering on a libretto carrying the weight of a dynamic personality, a woman’s ethnic heritage, representing the unique language of a region, and is overall representative of the cultural heritage of the Southern Appalachians of western NC, east Tennessee, north Georgia, the northern region of South Carolina. The Byna Project incorporates many of the arts—play writing, theatre, linguistics, cultural heritage, ethnic heritage, the composing of music, performance of music, ethnic arts—and more--geography, colonial history, US History and NC/GA/TN/SC history. Therefore a large number of educational outreaches can form around this project, particularly in a university setting. The Native American Studies and the Music Department at Newberry College, for instance, jointly presented BYNA in November, Native American History month, and educational opportunities for students were created by both departments. At Young Harris College BYNA was presented as the yearly public program centering on Appalachian themes; both the English Department and the Music Department sponsored educational outreach opportunities for students and the public. At Brevard College, area high school students/public came to the lobby of the Porter Center for the Performing Arts for a presentation by the composer/librettist which was followed up with an open rehearsal with the Ensemble. We had the opportunity to partner with several individuals and organizations for pre-concert lobby activities. We partnered with many regional Quilters Associations, who displayed early 1900s era quilts in the lobby and conducted pre-concert lap quilting demonstrations. We encourage presenters to fully explore the enormous partnering opportunities this project offers. Another important aspect of this work is the acknowledgement of the Cherokee heritage when speaking of the Southern Appalachian region. We very much desired to incorporate and reflect on the Cherokee’s role in the Southern Appalachian heritage and culture. In The Hemlock Trees Byna tells us of sitting under the hemlocks with her Grandmother who taught her the art of Cherokee Indian basket-making. 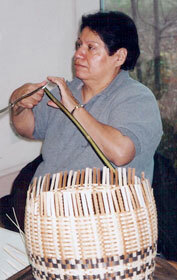 The river cane double-weave baskets made by the Cherokee women were among the goods first traded with British Traders who came into the Cherokee territory from the SC Colony. Today the art is kept alive in Cherokee by a small number of basket makers who practice the difficult craft of double-weave basket making—many of the women are older, and it is vital to inspire the younger generation to keep this art alive. We partnered with businesses specializing in Native American crafts who exhibited Cherokee crafts and baskets in the lobby prior to concerts. We partnered with the Cherokee Qualla Arts and Crafts Co-op who installed a basket exhibit in the lobby of the Porter Center two weeks prior to the NC premiere. 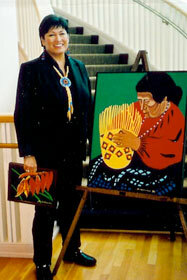 We have involved individual Cherokee artists in pre-concert exhibits prior to most of the BYNA concerts. Indeed, one of the project goals was to enable Cherokee artists to be a part of this project, providing them and their art/craft an avenue into the wider community. Toward that end, Cherokee basket maker, Lucille Lossiah, (left) conducted basket making demonstrations prior to the NC premiere and brought the raw river cane materials for concert goers to see. Cherokee artist, Faren Sanders Crews (left) who created the BYNA visual image—Byna and the Old Deer—(top of page) brought her art to exhibit prior to each BYNA concert. 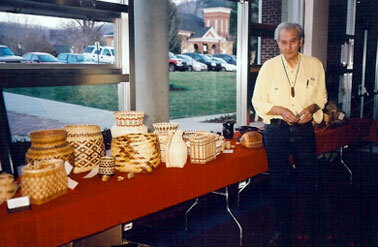 Cherokee artist’s participation is based on elements found in the text. The titles of two of the instrumental works in BYNA are taken from the Cherokees. Byna has been labeled, "Appalachian Romanticism." The work has strong theatrical elements, as the text was taken from a play and tells, in broad terms, the story of Byna’s life. The words reveal intimate, dramatic moments from her present and past life. The composer’s music purposefully and dramatically accentuates the words and very effectively captures the drama of the words and the mood of Byna’s surroundings, setting up dramatic elements which are rare in chamber music. “The cello is the earth upon which Byna walks--'black and rich." The piano is the spring from which she drinks in the morning, and the creek in which she plays with her dog. It is the morning light, and the sky with its changing colors. The oboe is the trees, the wildflowers, and the plants Byna loves, which surround her." Click here for the BYNA lyrics.